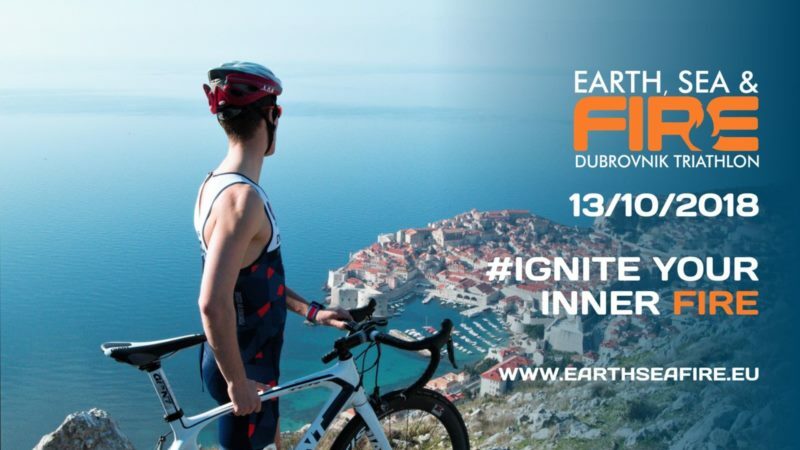 EARTH, SEA &amp; FIRE - Dubrovnik Triatlon: Ignite your inner fire in Dubrovnik! EARTH, SEA & FIRE is the name of the brand new triathlon event in Dubrovnik, scheduled for October 13th 2018. The first-time ever triathlon to be held in the southernmost Croatian city, offers two distances for both individual athletes and relay teams: Olympic triathlon includes 1,5km two-laps swim, 40km four-laps bike and 10km four-laps run combo, while Sprint Triathlon challenge includes 0,75km one-lap swim, 20km two-laps bike and 5km two-laps run. Calm sea, super-fast and flat bike and run routes make a perfect arena for experienced triathletes chasing standard-distance PB or aiming to break other records. First timers will have the chance for an authentic and fiery triathlon initiation, racing side by side with the best triathletes. If you're looking for an event to start your triathlon career, along with a great venue, perfect climate and friendly atmosphere, EARTH, SEA & FIRE is the right choice! Already well-positioned as an attractive destination for active holidays, Dubrovnik is a city that shares so much with the spirit of triathlon: steadfastness, relentless passion, ability to cope with downfalls and to rise again no matter what, over and over again. Naturally, all the participants will be able to enjoy all the beauties the southernmost Croatian city has to offer, including its ancient Old Town, a famous UNESCO World Heritage Site. The spectacular historic architecture and atmosphere of Dubrovnik will become a perfect background for the celebration of the inaugural EARTH, SEA & FIRE triathlon. Whether you're a newbie or Ironman finisher, we invite you to #IGNITE YOUR INNER FIRE this autumn in Dubrovnik!